Boba Fett is a minifigure based on the character from the Star Wars movies. 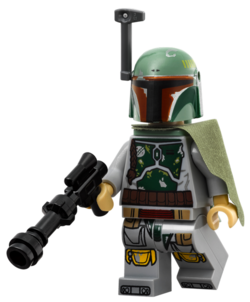 Initially released in 2000, Boba Fett has since had several variants created for him, and has appeared in all four LEGO Star Wars video games. Boba Fett's first appearance was in 7144 Slave I in 2000, and also appeared in 3341 Star Wars #2. This form of Boba Fett had a green printed Mandalorian armour, with light grey arms and dark grey hands. His leg piece was light gray and brown, and his head piece was black with no face. Boba Fett's Mandalorian armour was completed with his helmet and jetpack, which was one piece. The front of the helmet had printing on it around the visor section, as well as two black triangles above the visor and yellow rectangles on the top left-hand side. For the three sets in which this variant was released (the third set being in 4476 Jabba's Prize released in 2003), Boba Fett came with one weapon- a black gun. With the release of the Attack of the Clones subtheme came the 7153 Jango Fett's Slave I, which included a young Boba Fett with his father, Jango Fett. This version of Boba Fett featured him as a boy in blue clothing (light blue torso and legs, dark blue arms) with yellow hands and a yellow head with black printing for his face, with a black hairpiece. Due to his shorter stature at that age, Boba Fett had shorter non-moving legs which were designed for smaller characters such as Yoda and Ewoks. Boba Fett's next variant came in 2003. The variant was very similar to the original one, except it contained extra printing on the arm and leg pieces, giving the minifigure a more detailed appearance. This variant was exclusive to the 10123 Cloud City set, and came with the same gun piece as the original variation, but with a transparent orange stud on the front of it. He is one of the five Star Wars Mini Figures with detail on the arms being Boba Fett ,Greedo ,Darth Maul,Bespin Guard, and Jek-14 that were sold in sets, this is a very uncommon feature. After LEGO's change of colour with light grey and dark grey coloured pieces, Boba Fett was released again in two 2006 sets: 6210 Jabba's Sail Barge and 6209 Slave I, which was a remake of Boba Fett's main ship. This variant was of the same design as the original version, but with the grey colouring on Boba Fett's figure updated. 2010 saw the first major redesign of Original Trilogy Boba Fett, along with the third remake of the Slave I under Boba Fett's ownership. This variant of Boba Fett once again featured him in his Mandalorian armour, though the armour displayed on his torso appears more battle-worn than the previous incarnations. Along with armour printing on the torso piece, Boba Fett's dark brown utility belt is printed on along with a Wookiee scalp hanging down from the right-hand side. Boba Fett's arms are of a bluish-gray colour and have dark gray hands. The leg piece is be the same bluish-grey with dark red. 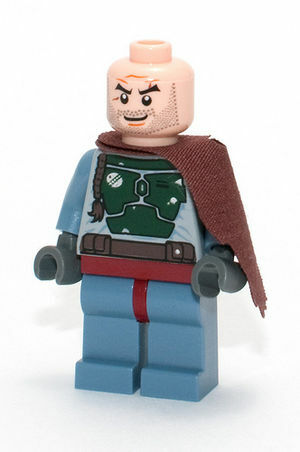 For this minifigure, Boba Fett has a face and not just a black head piece. However, at the toy fair, he shared this face with Argus Filch, who does not have the face in the final version of his first appearance. Boba Fett is released with a number of accessories including a blaster with a light grey TECHNIC element attached the end of it, to make the gun appear more like the EE-3 carbine rifle Boba Fett is known to use in the Star Wars Universe. Sitting between Boba Fett's head and torso pieces are two other parts- a brown cloth piece similar to a cape, which falls over Boba Fett's left shoulder, and a sand green jetpack piece, which was first introduced in 2009. Boba Fett's helmet is separate to the jetpack piece and fully enclosed. It is mainly sand green in colour, with some darker green printing, along with a black visor pattern and red markings around it. Some grey markings to represent dents in the helmet with the similar markings from the original helmet design is also included. The helmet also features holes (one on each side) where ARC Armour can be inserted. In this case, a rangefinder is attached to the right-hand side of the helmet. In 2012, two new Boba Fett minifigures were released. The first, released in the set 9496 Desert Skiff, features a similar torso and helmet print as the one released in 2010, along with using the same head piece. However, this version of Fett's legs have a dark green hip joint and are printed, featuring a continuation of the armor plating from the torso, orange kneepads and black and silver boots. The top section of the hip joint is also printed brown on the front side. This version of Fett retains his grey rangefinder from the 2010 version, but features a green cloth which is thinner than the brown one previously used, and has a gun made out of a blaster pistol joined onto a black piece commonly used as a lightsaber hilt. Also released in 2012 was a Celebration VI MINI Slave I at the San Diego Comic-Con International. This variant of Fett used the torso, leg and helmet pieces found on the other version released in 2012, but had a black headpiece with a smiling flesh-coloured face printed on it, a piece which was first used for Stormtroopers, Scout Troopers and TIE Pilots. Apart from the helmet, this version of Fett did not come with any other accessories. 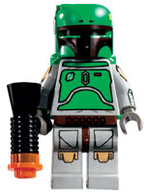 In 2013, a redesigned version of Boba Fett as a child was released in the 75023 Star Wars Advent Calendar. He has long black hair and a double sided face. One side of his head features neutral expression whilst the other has a grinning face. Boba has a light blue torso with some skin showing at the top, wrinkles and a brown belt at the bottom. He has dark blue arms and light nougat hands. Boba also has short, light blue legs. The all white promotional version of Boba Fett. Four promotional versions of Boba Fett have been created and released to date, all in 2010. The first variant released was a white Boba Fett. Ten thousand of these minifigures were released. The first known main release was when 150 of these Minifigures were given out at the 2010 Canadian Toy Fair. This minifigure has the same pieces as the original version- legs, torso, black head and joined helmet and jetpack piece. The difference is that the minifigure's legs are all white as is the helmet/jetpack piece. The torso is also white, but features some black outline printing on it to represent Mandalorian armour. Approximately 320 of these white minifigures were distributed during LEGOLAND California's LEGO Star Wars Days held August 7 and 8, 2010. The minifigures were given to winners of the Jedi Trivia contest. The second release was a solid bronze Boba Fett, given away as part of LEGO's "May the 4th" promotion. There are only two of these minifigures in existence, and was randomly given away to an order from the US or Canada with selected Star Wars sets ordered during the promotion. This minifigure has torso, leg, head and helmet/jetpack piece, all of which are solid bronze. During Comic-Con in 2010, a competition was held, where the winner would receive a one promotional white Boba Fett, along with one of two 14 carat gold minifigures, and one of two sterling silver minifigures. The three minifigures were presented in a frame with a certificate of authenticity. These gold and silver variants were in the mould of the Boba Fett released prior to 2010. The other gold and silver Boba Fett minifigures were given away during Star Wars Celebration V.
In 2012, the game 3866 The Battle of Hoth was released, which included a Boba Fett microfigure. This figure is sand-green, and features dark green printing for armour, brown printing for a belt, and black and red printing used to depict Fett's helmet. Also, silver printing is used to depict scratches and the logo on his armour, and further black printing is used for detailing and outlining. Boba Fett made his first video game appearance in 2005 with the release of LEGO Star Wars: The Video Game. Boba Fett's appearance in this game was based on his child variant (as the game was set during the prequel trilogy). The child Boba Fett was able to single-jump, and had the ability to fit through tight places. In this game, Fett did not have any weapons. Boba Fett's next appearance was in the game's sequel- LEGO Star Wars II: The Original Trilogy. This time, Boba Fett was based on his more recognizable form in green Mandalorian armour, and was similar in appearance to his first and fourth variations. Boba Fett once again was able to single-jump, but to also hover in the air after this jump using his jetpack. Boba Fett also had a blaster and can also fire missiles after the "Bounty Hunter Rockets" Power Brick is found and the extra is purchased. Boba Fett's first video game version as a boy can also be unlocked if memory data from the previous game is inserted into the console, and the "Use Old Save" extra is unlocked and applied in-game. 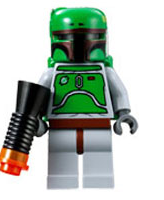 Boba Fett's third video game appearance was in LEGO Star Wars: The Complete Saga released in 2007, where both his boy and bounty hunter versions were available. Boba Fett appeared in 2011 in the video game LEGO Star Wars III: The Clone Wars. He appeared as a child, but completely redesigned torso, leg and head pieces, and with a recoloured hairpiece. He also appeared as the 2010 redesigned Boba Fett. In 2007, Gentle Giant produced a figure approximately 6 inches tall of Boba Fett. While the maquette is not actually LEGO, it did depict Boba Fett in LEGO form. 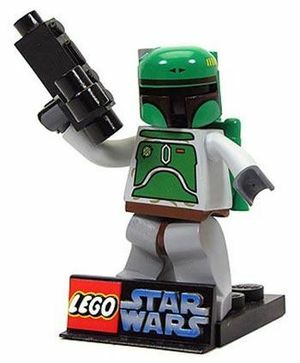 The figure is designed to look like Boba Fett's original minifigure design, and has him holding a blaster, which is a shorter version of Part:4360, a part which has been used as a blaster rifle in past LEGO Star Wars sets, and a bazooka or a camera in other sets. Boba Fett was a clone of the bounty hunter Jango Fett, and raised by Jango as his son. Boba was "born" on Kamino, 31 years before the Battle of Yavin, and throughout his childhood received extensive training to become a bounty hunter from his father. When he was roughly ten years old, a Jedi Knight named Obi-Wan Kenobi met the Fetts on Kamino, who attempted to take Jango back to the Jedi Temple for questioning after receiving orders from Grand Master Yoda. However, Jango and Boba managed to escape on the Slave I after a brief but intense duel between Kenobi and Jango, with Boba assisting the latter by operating Slave I's laser cannons. However, Kenobi managed to place a homing beacon on Slave I, and began to follow it to the planet Geonosis. Jango eventually realized this, and attacked Kenobi's Jedi Starfighter with a range of weapons, and believed him to have perished in an explosion from a missile, not realizing that it was actually spare parts that Kenobi jettisoned which blew up. On Geonosis, the Fetts, along with leading members of the newly formed Confederacy of Independent Systems such as Count Dooku and Nute Gunray, attended what was to be the execution of a captured Kenobi along with his Apprentice Anakin Skywalker and Padmé Amidala, who had attempted to rescue him. However, over 200 Jedi appeared in the execution arena before this could happen, and a battle between Jedi and Battle Droids along with Super Battle Droids ensued. Boba's father joined the battle in an attempt to kill Mace Windu, however Windu was able to deflect Jango's lasers and decapitate him. The battle in the arena ended shortly after when Yoda along with Clone Troopers on Republic Gunships managed to evacuate the remaining Jedi, leaving Boba alone with his father's head and lifeless body. Throughout the years after this event, Boba Fett grew to be known as the most feared bounty hunter in the Galaxy, like his father before him. Boba carried out many bounties, either working alone or with other bounty hunters such as Dengar and Bossk. Fett took to wearing green Mandalorian armor, and was never seen in public without his helmet on. One such bounty was to find the Millennium Falcon under the request from the Sith Lord Darth Vader, three years after the Battle of Yavin. Fett was the only bounty hunter successful in locating the Falcon on Cloud City, Bespin, and was rewarded for his efforts by Vader. Han Solo, the Captain of the Falcon was put into carbonite, and Fett transported him to Jabba the Hutt for payment. One year later, a group of members from the Rebel Alliance composed of Jedi Knight Luke Skywalker, Princess Leia Organa, Chewbacca, Lando Calrissian, R2-D2 and C-3PO attempted to rescue Captain Solo from Jabba, most of which ended up being captured by the Hutt, but not before Leia freed Solo from his carbonite. Fett, along with others staying at Jabba's Palace, went aboard Jabba's Sail Barge to watch the prisoners being fed to a nearby Sarlacc, however Skywalker managed to fight back after catching his lightsaber after it was catapulted to him from R2-D2, and a battle began. Fett, intent on taking down Skywalker , did not notice a temporarily semi-blind Solo nearby, who accidentally activated the manual controls on his jetpack when he hit them with a staff. Fett crashed into the side of the Sail Barge, and fell into the mouth of the Sarlacc below. 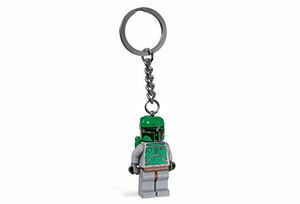 Fett's appearance as a Key Chain in 851659 Boba Fett Key Chain. Fett taking orders from an injured Vader in Bombad Bounty. Boba Fett with Jango Fett and Mace Windu in LEGO Star Wars III: The Clone Wars. Boba Fett in LEGO Star Wars III: The Clone Wars. Several views of the white Boba Fett. The Proto Fett with his helmet and jetpack removed. This page was last edited on 11 June 2017, at 00:43.